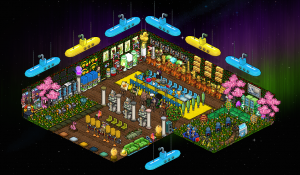 Ultra Rare Trade is a popular trade room on Habbo and is home to the largest trading forum on the hotel. The room itself is mainly used to display some of the rarest and most exclusive items on the hotel and has become synonymous with Holly Garland walls, and a long, cluttered table of HC Plasto - a signature of Ultra Rare Trade. For a very long time Ultra Rare Trade was an exclusive trading group for well known and respected traders in the community, and as all members used to receive room rights automatically, you also had to be very trusted to join. Along with the revival of the Ultra Rare Trade Forum in October 2015, membership became open to everyone, however from then on rights were restricted to only the forum admins and therefore changed the nature of the trade room fundamentally. The trading room started out as a small super rare collection in a room owned by redos in September 2014, and former initially the group only consisted of four members, DJ_Shadow, redos, vlexy, and StealthJames. (ChimeraHQ). The primary purpose of the room was so that these users could display their rares collectively, and could also be used as a small trade room. However as their collections grew and grew, the size of the room became an issue and was no longer practical. They all agreed to move room, and as DJ_Shadow was the only member of builders club, they moved to a new group made by him. After completing the transition from the old room to the new one, the room kept its original feature and style and rebranded itself as Ultra Rare Trade. Additionally, with the use of the floor plan editor, the size of the room can be adjusted to fit around the collection and expand if needs are without having to change rooms again. It wasn't before too long the room started to gain popularity, with many other collectors wanting to join the trade group and contribute to the collections. As everyone in the group had rights to drop and move furniture, it could be treated as a room which belonged to all the members, and as a result, items constantly came and went. The group grew at a staggering rate, reaching 40 members in December, and the room eventually reached the point where it couldn't be expanded anymore. However in late November for unrelated reasons a significant number of members picked their items, leaving the trade room quite empty. This resulted in the trade room closing its doors on 27th November 2014. In early January 2015 there were a couple of rooms which were attempting to emulate Ultra Rare Trade, using a similar style of the room, and in some cases trying to operate under the name of Ultra Rare Trade itself. Some of the original members of Ultra Rare Trade room were discontent with this, and also with the fact most of them were not part of the new rooms. Therefore on the 18th January 2015, DJ_Shadow recreated a second Ultra Rare Trade room under the original management. Naturally, those who were involved in the room the previous year were happy to rejoin, and soon the room was growing again. In October the group membership reached 100 contributors, all with room rights. However later that month the owner of the then largest trade forum at the time was caught in a scam scandal, which subsequently saw the demise of that forum. Therefore on the 22nd October, the Ultra Rare Trade forum saw a great revival. The group opened itself up from a private trading club into what would become the largest trading hub (below the marketplace), and the most viewed forum on the market - attracting nearly 500 weekly viewers. Due to the popularity of the forum, it was largely featured in a Sulake blog article on trading in November 2015. Despite having around 100 people with room rights for over a year, Ultra Rare Trade was never trashed in that period. 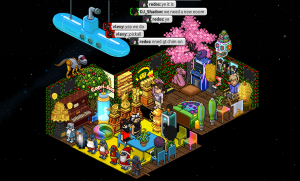 The trading room broke the record for the largest Infobus wall in Habbo (22 Infobuses), and the largest amount of Army Plasto Chair in a room at any given time (23 chairs). Ultra Rare Trade is credited for the growth in popularity of the use of HC plasto sets in trade rooms, with several rooms that were inspired by the group. For a few consecutive months, the trade room was arguably the most valuable room on the hotel, with over 10,000 gold bars worth of furniture. Ultra Rare Trade Forum hit their 1,000 members milestone on January 17, 2016. This page was last edited on 18 April 2018, at 11:21.